May be of the busy schedule with no rest, or may be of rifts in the team ,or may be of no commitment in the play ,The T20 World Champions of 2007 ie our team knocked out of the tournament.We lost both the matches in super 8 played against WestIndies & England. 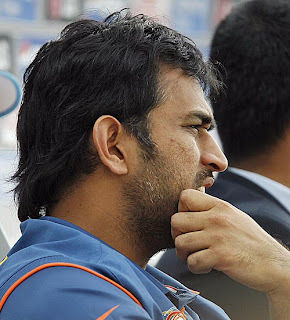 If India would win the play against England,we have the safe chances 2 go into semifinals.But the outcome has came diffrent.During the start of the play ,Dhoni won the toss and opt 2 field first .Bowlers has done well and locked England players for 153/7 in 20 overs.Harbajan nd Jadeja bowled well and scalped 3 and 2 wkts respectively. Even there are loopholes in bowling ,like unusual runs of 4wd ie 4+wide in harbhajan bowling because of the misfield by gr8 fieldie Yuvi cost our loss.Totally in dis way happened twicely,or else Eng score would be 143 instead of 153.In dis way our bowlers given 14 wides where as Eng bowlers had given only 4 wides.Coming to batting ,Eng Captain Pauly asked their bowlers to bowl mostly short pitch bowls,were our some indi players are weak 2 play short pitch bowls.50% of bowls bowled by Eng bowlers are short pitch bowls ,and by dis we can analyze how weak we are.And the other thing is Dhoni opted Ravindra Jadeja as 2nd down ,where he faced 36 balls for his 25 runs.If Yuvi would come down in 2nd down the outcome may be positive.Lastly Yusaf Pathan nd Dhoni tried best,but we missed the oppurtunity and put in the hands of British players.England won by 3 runs.Overall we can say there are some loopholes in the play yesterday . At the end of the play Dhoni confessed honestly that becaz of poor perfomance of batsmen they lost the game without saying any excuses.Atleast from Now we wish thet Dhoni & Co would do better in the future.